We treat the person & condition not just the symptoms. 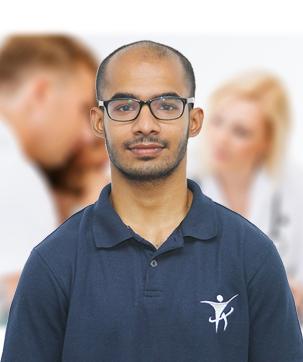 All our physiotherapists are professionally qualified (Bachelor or Masters in Physiotherapy) and has experience in the field. Promotion : Promote a healthy lifestyle. Prevention : Taking precautionary steps. Rehabilitation : Learning how to manage the condition, repair the damage and restore the body. She has a Bachelor of Bachelor of Physiotherapy from the Rajiv Gandhi University, Bangalore. She has a Bsc In Physiotherapy, Peradeniya University. He has an Msc In Advancing Physiotherapy Practice, Coventry University UK. 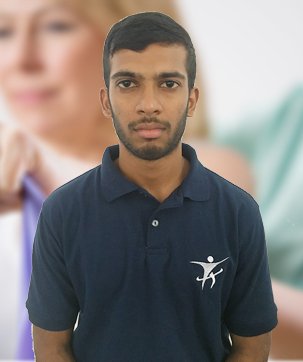 He practices Musculoskeletal & Neurological rehabilitation Physiotherapy . We use the modern technology equipment for the treatments we provide. 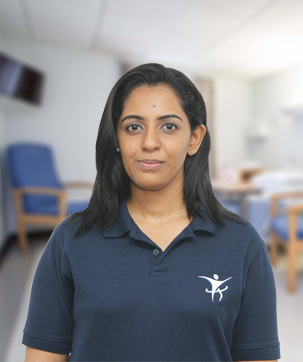 All our physiotherapists are professionally qualified and experienced. We give our best service for our patient and make them comfortable. I have been suffering from osteophytes and disc bulge for more than 15 years, having gone through many physiotheropy sessions, to have had not much success inreleiving the pain. Just after 3 sessions at Physio Medicare, with Shawn I'm finally getting the relief that I had hoped for. Thank you Shawn. Highly Recommended !!!!! Mr. Yohan was my Physio. Great service and I am happy with his treatment for my knee. I highly recommend Physio Medicare and especially the services of Shawn Roche who treated me. He is very friendly. I had serious back pain for more than about 2 months. Sometimes I can't walk the pain really bad for me. I went to doctors but not got a fixed result. I met Shawn, he analyzed my problem and treated. One time chapter close. Yes, my back pain runs away :). I am very good now. I can highly recommend Shawn Roche. Thanks for that. I was very impressed from the first day I met Shawn. He's been very supportive n professional throughout the whole time. He actually found the root cause to all the issues I've been having for many years and has treated me n given me all the instructions to follow. He's been very helpful and checking whenever he can, whether im making progress or how he can help me. He's simply the best. The only thing I regret is not going to meet him sooner. I was suffering from a pinched nerve. since 1st of January 2019. a friend of mine recommended me to go to Physio Medicare. And tell all my medical problems and physical issues I am going Through... I met Shawn Roche I only went for three sessions and he fully treated me. I am now fully recovered. and feeling much better... Thank you! Shawn Roche 🙂 you really got magic hands 🙂 I would totally recommend Physio Medicare! To anyone Who needs physiotherapy. I've been visiting Physio Medicare since 2016. I greatly value their service and care given towards my knees. I greatly appreciate the efforts shown by Raveene and her team in making my treatment process smooth and comfortable. excellent service...you will always want to go back! Excellent service! I noticed that the chief doctor and the other staff are really friendly and kind. I came for a cirvical spondylosis treatment and I am able to find significant improvement within just two weeks. I highly recommend this place as they are really great with their patients. Many thanks to my physiotherapist Ravini. Miss Nilakshi's therapy for sure.. she would not only treat the symptoms but the root cause as well. Very supportive. She would get excited each time i say that pain has been reducing after her therapy sessions. With so much love and care she would treat me!! Nidhya is my physio for my frozen shoulder. there is an improvement in my shoulder. pain. she is very gentle and encouraging . The service provided is highly appreciated. The best physio clinic I have visited. Ms Rawini is my physio. great service and am happy with her treatment. I recommend this place to any. I have been there a several times Nilakshi and her team have been great and sorted most of my injuries. Thank you. මාගේ වම් අතේ ඇඟිලි තුනක් හිරි වැටීමෙන් හා මැණික් කටුව ප්‍රදේශයේ වේදනාවකින් මාස කිහිපයක් පීඩා විඳි අතර වෛද්‍ය ප්‍රතිකාර කිහිපයක් ගත් නමුත් සුවවීමක් නොමැති විය. පරීක්ෂණයක් සිදුකර ඒ අනුව සුලු ශල්‍ය කර්මයක් සිදු කිරීමට විය හැකි බව ප්‍රතිකාර ලැබූ කිහිප තැනකින් නිගමනය විය. මාගේ මිතුරකු වන බුද්ධික Buddhi Weby විසින් ෂෝන් රෝච් (Shawn Roche ) මහතා විසින් කරන භෞතචිකිත්සා ප්‍රතිකාර ගැන දැනුවත් කිරීමෙන් පසු එම ප්‍රතිකාර තුලින් මෙය සුව කර ගත හැකි වෙතැයි යන විශ්වාසය මත මම ඔහු සමග ෂෝන් රෝච් මහතා හමුවීමට පැමිණියෙමි. ෂෝන් මහතා ඉතා විමසිල්ලෙන් රෝග ඉතිහාසය පිළිබඳ විමසා බලා භෞතචිකිත්සක ප්‍රතිකාර මගින් මෙය සුව කිරීම සඳහා ප්‍රතිකාර ඇරඹූ අතර එහි ප්‍රතිපලදායක බව වැඩි කිරීම සඳහා ව‍යායාම කිහිපයක්ද හඳුන්වා දෙන ලදි. මේ අනුව ක්‍රියා කිරීමෙන් මැණික් කටුවේ වේදනාවත් ඇඟිලි දෙකක හිරි වැටීමත් සම්පූර්ණයෙන්ම සුව අතට හැරිණි. අනික් ඇඟිල්ලේ හිරි වැටීමත් ක්‍රමයෙන් සුව වෙමින් පවතී. තව දුරටත් ඔහු විසින් නියම කරන ලද ව්‍යායාම උපදෙස් අනුගමනය කරමින් සිටිමි. ෂොන් රෝච් මහතා විසින් දෙන ලද උපදෙස් පිළිපැදීමෙන් හා ඒ අනුව නිවැරදි ඉරියව් පවත්වා ගැනීමෙන් ඉක්මන් සුවයක් ලබා ගැනීමට හැකිවීම පිළිබඳ මාගේ ස්තුතිය ෂෝන් රෝච් මහතාට පළකර සිටිමි. එමෙන්ම ව්‍යායාම කරගෙන යාමේදි ගැටලු වලදී ඕනෑම අවස්ථාවක පිළිතුරු සැපයීමට ඔහු සූදානම්ව සිටීම මහත් උපකාරයක් විය. ඔහු විසින් සැපයූ සේවය ඉතා අගය කොට සලකමි. 👊👊👊👊 ස්තුතියි ! I suffered from a pain in three fingers in my left hand and the wrist for few months. There was no luck although I got several treatments from several places and I came to know about Shawn Roche from Buddhi Weby my friend. I came to meet Shawn Roche believing that his physiotherapy treatments will help me to recover from this. He was kind enough to listen to all the history of the problem and started treatments and assigned some exercises too to continue. With the help of his treatments and assigned exercises, I was able to get recover from the pain of the wrist and two fingers. The other finger's pain also getting recovered gradually and I am continuing the exercises given. I would like to thank Shawn Roche for his treatments and advises which showed me the way to speed recovery. The best thing is he is available anytime via messengers and phone to answer regarding problems. I highly appreciate his valuable service and wish him good luck ! Thank you ! I suffered from a upper back strain for over 2 months and had a physiotherapy session with Shawn last week. He explained the situation clearly and made few adjustments to bring immediate relief to stiffness I felt. Dry needling session conducted afterwards seems sealed the deal as since then I don't feel any stiffness or strain. Thank you Shawn for very professional yet friendly service. Highly recommend for anyone who got the need. I was suffering from severe pain in my knees and my lower back for a very long time and walking was excruciating as I had to just limp along ! To put me out of this misery, I tried out Eastern and Western treatments in the way of Herbal and Oil massages, Acupuncture and Physio Therapy as I really did not want to have the injection nor surgery and even had contradictory diagnoses too. However I was introduced to Physio Medicare just about a month ago by a close relative who was already undergoing Physio therapy there. I had therapy sessions twice weekly for the first two weeks and thereafter it’s just once a week, today being my 6th therapy session. I can just simply say that my Physio Therapist Ms. Nidhya, has done an amazing job by reducing about 75% of the pain (that I have been suffering for many many months) within just one month ! I was very impressed with the detailed assessment, diagnosis and method of treatment that Physio Medicare does and am aware that I still need a few more therapy sessions but with regular prescribed exercising, am very confident that I will be back to normal very shortly. The Centre which is very clean, neat and professionally run is also equipped with various types of equipment which we use for our treatment. I am very grateful to Ms. Nilakshi and Ms. Nidhya for their help in relieving my aches and pains ! Miracles do happen.Thanks to physio Shawn Roche,..Yeah he is just not a physiotherapist he is a miracle creator.I was suffering from coccydinia.Due to a fall my coccyx got hooked in a severe way.I went to several so called reputed orthopedic surgeons.But they recommended pills and injections,which I refused at once. Luckily I came for Shawn’s treatments...It was only two sessions.The whole pain in my legs hips and buttocks is vanished after the treatments.Also,the stiffness around my tailbone area has gone away. These words are just not enough to recommend how great he is in his subject.Thank you very much and keep up the good work. I twisted my foot and despite resting if for more than 3 weeks as adviced by most people, it just didn't seem get back to normal. Remembered my old friend Shawn and met him at his clinic. He pulled a few muscles and massaged a few areas and adviced that I start walking and get active again. Just like that, in less than a week my foot is now completely normal and most importantly I can land on it when bowling in the nets and don't feel a thing. Thank you Shawn. You are an absolute genius. I have been suffering from a critical knee & shoulder injury and luckily I came across Mr. Shawn and physiomedicare through the Shed. Within the hour of Shawn's treatments/therapy session all the pain was gone like magic! Thanks shawn! I would recommend this amazing place to anyone without any second thoughts.